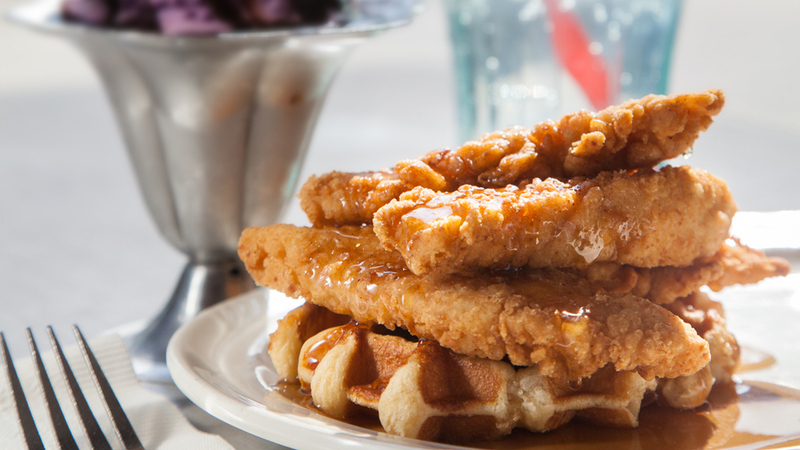 Five crispy chicken tenders tossed in a honey maple sauce on a pearl sugar Belgian waffle. A warm Belgian waffle with whipped topping. Add your choice of applewood-smoked bacon, sausage or strawberry topping for extra cost. There's nothing like sweet, golden brown french toast! We make ours with 3 slices of batter-dipped Brioche bread. Add your choice of applewood-smoked bacon or sausage, or maybe try it with strawberry topping (for extra cost). Some things never go out of style. We think delicious, fluffy buttermilk pancakes are one of 'em. Add your choice of applewood-smoked bacon, sausage or strawberry topping for extra cost.